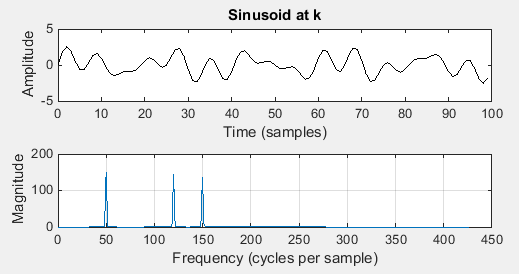 This post briefly describes how to plot and extract the frequency from single sinusoids in MATLAB with Fast Fourier Transform. 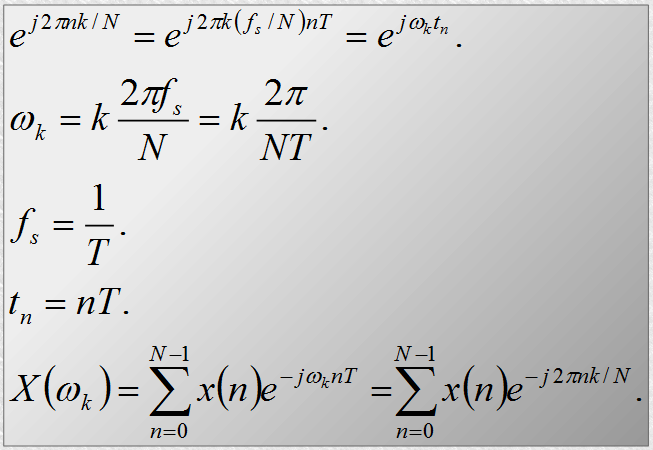 Figure 1 shows a few important formulas that we will use. Let us define a few MATLAB constants. The k-constants below are used to define a few frequencies. We will set T and f_s to 1, as is typically the case. A is an amplitude. 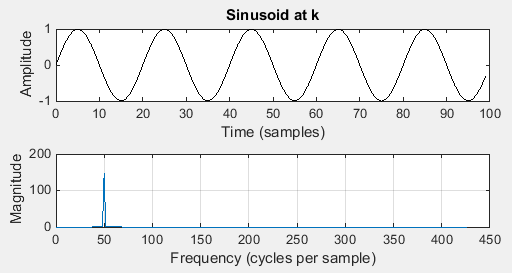 We will not define N explicitly, i.e., number of time samples, because NT are common to all sinusoids and effectively acts as a scaling factor. Now we can define the frequencies and the time axis and sinusoids. t = 0:0.001:0.6; %% from 0 upto 0.6 in increments of 0.0001. We can start with defining the figure that has two subplots. 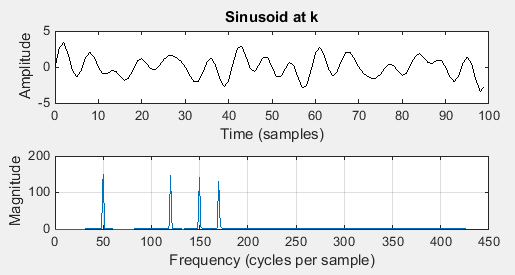 The upper plot is the graph of a specific sinusoid, i.e., the signal in the time domain. The lower plot is the spectrum plot with the frequencies detected by the FFT. Now we use the FFT to compute the spectrum and normalize it by the length of the time axis. All is left is to create the second subplot and label. Figure 2 shows the results of plotting s = A*sin(wk1*t). Note that the frequency plot shows a spike at 50. Figure 3 shows the results of plotting s = A*sin(wk2*t). Note that the frequency plot shows a spike at 120. 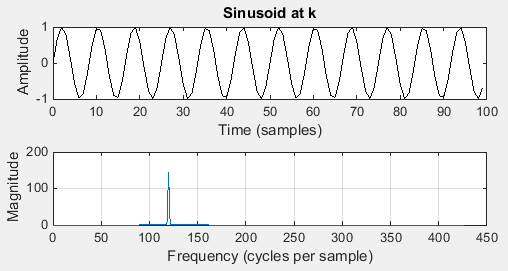 We are now in the position to combine sinusoids and use the FFT to extract frequencies from these combined sinusoids. These examples are more realistic in that the real signals have multiple frequencies and noise. 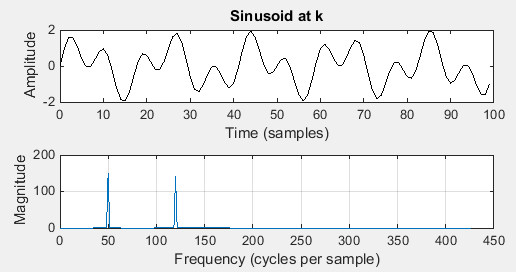 Figures 4 - 6 show the plots of different sinusoid combinations. Figure 6. Time and frequency plots of s = s = A*(sin(wk1*t)+sin(wk2*t)+sin(wk3*t)+sin(wk4*t)) with spikes at wk1=50,wk2=120, wk3=150, wk4=170.